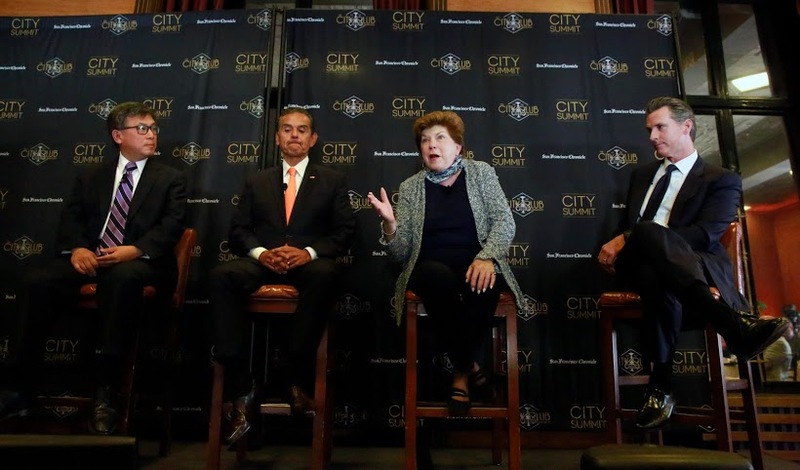 John Chiang, Antonio Villaraigosa, Delaine Eastin and Gavin Newsom (l to r) in a forum in San Francisco with Democratic candidates for governor in October 2017. The Democratic candidates for governor agree that California must increase education spending and expand access to child care. But the four candidates differ on how they would work toward their goals to improve education in California. And they split on one aspect of a contentious issue in the race for governor: Whether districts should be allowed to reject charter schools based on financial impact. EdSource asked the six leading candidates for governor to answer a questionnaire on some of the most pressing education topics in the state. You can read the candidates’ full responses here. The race’s four leading Democratic candidates — Lt. Gov. Gavin Newsom, former Los Angeles Mayor Antonio Villaraigosa, State Treasurer John Chiang and former State Superintendent of Public Instruction Delaine Eastin — answered the questions. The two Republicans running for governor, businessman John Cox and Orange County Assemblyman Travis Allen, R-Huntington Beach, declined to participate. All four said California should spend more on its K-12 students, but Villaraigosa split from his fellow Democrats when asked about a plan now in the Legislature to dramatically raise per-pupil education funding. The California School Boards Association and the California State PTA both support setting a goal of increasing by 60 percent base funding in the Local Control Funding Formula, the 2013 law that gives districts greater decision-making authority over the use of state funds and provides extra funds to educate English learners and low-income, foster and homeless children. The proposal would increase funding from about $8,000 to about $12,800 per student. Newsom, Chiang and Eastin backed the idea. “We simply must invest more in education,” Chiang said. Villaraigosa was not sold, however. “While I think more money is important in a state that lags far behind the national average in per-pupil spending, we have to show we can do more with the money we’ve got to make a persuasive case to the public that more money will bring a marked improvement in our schools,” Villaraigosa said. He pointed to the Partnership for Los Angeles Schools, which he said turned around low-performing schools through a combination of increased funding, better accountability standards and collaboration between parents, teachers and principals. All of the Democrats said they would continue the Local Control Funding Formula, outgoing Gov. Jerry Brown’s signature education funding program. But Villaraigosa, Chiang and Newsom said they wanted greater transparency in how districts spend the money they receive under the law. “Some school districts used the LCFF funds to restore teacher pay or address other budget shortfalls — we have to do better,” Villaraigosa said. Charter school backers, led by a handful of wealthy donors, have poured millions of dollars into an independent committee backing Villaraigosa. Teachers unions have endorsed and given money to support Newsom. EdSource asked the candidates whether local school districts should be allowed to reject charter school applications if the charter could be a financial drain on the district. Officials for some districts with large numbers of charter schools, such as Oakland and Los Angeles, have said the charter schools are reducing their enrollment and state funding. The issue has become a hot button one. Many charter advocates fear that if school districts are allowed to take the financial impact of charter school expansion into account when awarding charters, school district administrators would use it as an excuse to simply reject them. “I believe financial impact should therefore be a consideration, not a deciding factor” when deciding to approve a charter, Newsom said. Villaraigosa, as well as Chiang, did not directly answer the question. But both expressed support for charter schools. “I support high-quality public schools and high-quality public charters. I think it’s important to support those public institutions which are innovating and successfully educating our children,” Villaraigosa said. The four Democrats reiterated their support for universal pre-kindergarten education for all California 4-year-olds, and said the state shouldn’t stop there. Each said California should provide more support during the first three years of children’s lives, and said they want to ensure more families have access to affordable child care. “Child care and early childhood education are economic justice issues, and as governor I will work to address these critical issues,” Chiang said. Newsom said the state should start even sooner, with expanded access to prenatal care and paid family leave. Villaraigosa said he would create a Master Plan for Early Education and appoint a cabinet-level Early Child Care and Education Coordinator. “If we’re going to get serious about closing the achievement gap, we have to start at the beginning,” Villaraigosa said. Eastin, who also called for providing three months of fully paid maternity leave, was the only candidate to detail how she would pay for such expansions in early education. She called for an overhaul of California’s tax law to raise commercial and industrial property taxes and boost local education funding by making it easier to raise parcel taxes. “We need to shift our budget priorities from a ‘pay later’ mentality to an investment mentality,” Eastin said. To be certain, Newsom also did not answer the question whether districts should be able to deny charters based on financial impact to the district. In fact, he contradicted himself. So I guess I was incorrect in saying he didn’t answer the question. He answered it twice, disagreeing with himself.